Jeff Stark, writing for Coin World, has published this comprehensive account of the CPAC hearing on the Egyptian MOU. It focuses on coins, of course! Archaeo-blogger Nathan Elkins has missed another opportunity to engage in real dialogue. In his latest article on the subject, he again lectures others about his views about the "morality" of collecting unprovenanced coins. As a staunch supporter of the AIA campaign in favor of import restrictions, this should not be surprising. As far as the AIA is concerned, ethics appears to be largely for the other guy. But the AIA needs to rethink its own views in order to find a way forward. And Elkins should also consider what archaeologists can themselves do to protect context. At a minimum, why not hire site guards or at least monitor sites remotely during the long periods they are not being worked? Or more importantly, why not promote programs akin to the Treasure Act and Portable Antiquities Scheme? This program-- which Elkins has in the past seemed to support-- encourages the public to report what they find. It also gives state museums a right of first refusal as long as the finder receives fair market value for their coins. As CPO has said before, it should be about conservation not control. CPO can't but help wondering after reading Thomas Friedman's interesting opinion piece whether the "State Owns Everything" model favored by Arab Dictators inexorably leads to the "Trash the Past" model of Islamic Fundamentalists. The former have mismanaged and exploited cultural heritage for their own ends for generations. The latter recently ransacked the Malawi Museum in Egypt. And now, they are even more menacingly being embodied by the iconoclasts of ISIL. Hammer in one hand and video camera in the other, they gleefully record their work to horrify Westerners and those in their own societies still rightfully proud of their pre-Islamic past. Friedman suggests that the emergence of a model that respects individual liberties and rights is the only way forward in the Arab world. So too with antiquities. The "State Owns Everything" model only associates them with hated dictatorial regimes and devalues them so thoroughly that they are smuggled or even destroyed. So, when fanatics move in, there is really little public sentiment to stop them from doing the worst. In contrast, a model that allows the populace to own and trade in at least common antiquities can only stimulate interest in the past and the protection of more important artifacts and historical structures. So why is the AIA and the archaeological blogosphere still so in favor of the "State Owns Everything" model?" Is it the fear of offending cultural bureaucracies of the aforementioned dictatorships which control the issuance of excavation permits? Or, monopolistic sensibilities? Or, something else? One thing is sure, though-- the current status quo in these countries has failed to save the past. 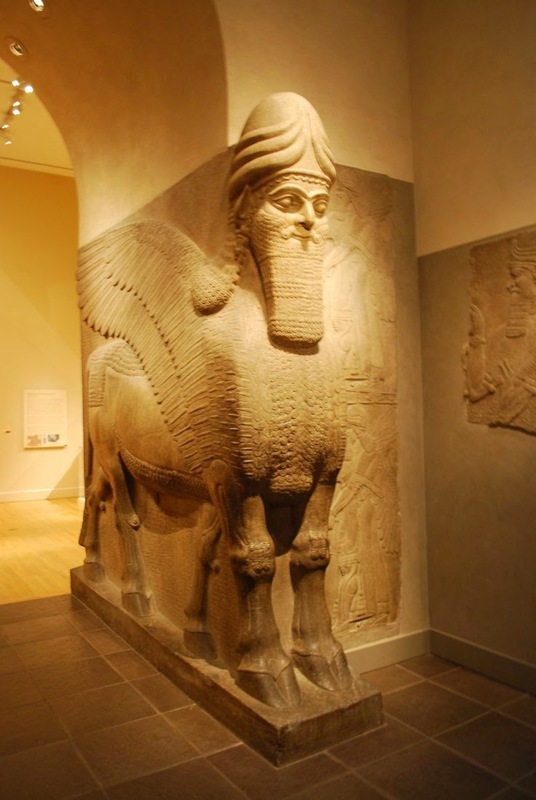 Good thing then that at least some of these artifacts, like this magnificent Man-Headed Winged Assyrian Bull, have been preserved in Western Museums, like the Louvre. There is little good news coming out of Syria these days. So it's good to hear that non-sectarian Syrian opposition forces are taking concerns about damage to Syrian cultural treasures seriously with concrete steps to try to shelter these treasures in place. The problem of course is the rise of ISIS which would rather destroy antiquities for show than protect them. And with ISIS controlling more and more territory in both Syria and Iraq, this problem has only become magnified. UNESCO and the Iraqi cultural bureaucracy are up in arms because some valuable Islamic manuscripts were removed from ISIS controlled Mosul and taken to Turkey. One wonders if UNESCO and the Iraqi cultural bureaucracy would rather have seen them burned by Islamic fanatics instead. If anything, the rise of ISIS and the the devolution of the rest of Iraq into a Shia-dominated sectarian rump state also confirms the wisdom of keeping the Iraqi Jewish archive in the United States. CPO was dubious about the archive's repatriation even before the wheels came off in Iraq. Yet, CPO suspects there are still some in the archaeological lobby still pressing for the return of the archive to an uncertain fate. It's estimated that there are only approximately 11,000 archaeologists in the United States. Most appear to either be employed by the federal government or not for profit educational institutions. Of this small number, only an infinitesimal few seem to be active in lobbying against private and museum collecting, perhaps 50-100 or so. No doubt all, or most of these individuals, really believe in what they are advocating. But even so, given the small numbers why all the influence? Could it be because this small group works hand in hand with foreign governments (including most recently the Egyptian military dictatorship) that offer excavation permits? Or that they are joined at the hip with cronies in both the State Department and in US law enforcement? Or that their time and efforts are effectively funded by tax or tuition dollars? Or that not much thought is put into the actual basis for source country claims? Or that lazy media outlets are all too often ready to take what they say at face value rather than actually check sources? Or, all of the above? Investigations Needed of Close, Secretive Ties to Middle Eastern Dictators and Terror States? According to the archaeological blogosphere there are links between terrorists and collectors that must be investigated. If so, CPO hopes any such investigation also explores the established but opaque links between the archaeological lobby and Middle Eastern military dictatorships like Egypt and even terror states like Saddam's Iraq, the Assads' Syria and the Mullah's Iran. Any such links are potentially far more dangerous to our own national security than a few cylinder seals in the hands of terrorists. And this is no job for Homeland Security or even the FBI. No, this is one for the CIA or perhaps even the NSA. They'll get to the bottom of all this-- though, of course, we may never learn what they find. Thankfully, others with no such axe to grind have exposed the dubious nature of such claims. First, former senior Homeland Security official Jim McAndrew debunked such claims at a recent public forum. And now Derek Fincham, who not generally known as a friend of the antiquities trade, raises his own questions about the motivations behind the recent spate of stories on the subject. There are good reasons to ban the trade in modern ivory products. But what of antiques with historical and artistic value? Or, ancient artifacts like Byzantine ivory diptychs? That's where overkill comes in. And that's exactly what's now happening in New York State where New York's Governor, at the behest of Hillary Clinton and wildlife advocates, has pushed through a bill that bans the sale of any antique with an ivory content over 20%. The provision in the bill should be rethought-- the idea that sales of antique ivory encourage the sale of modern ivory is without evidentiary support. has started in the archaeological blogosphere on the government's handling of the Ka-Nefer-Nefer forfeiture case. The consensus from the experts associated with the repatriation lobby appears to be that the government should have brought a criminal case against the dealer rather than a civil forfeiture case focused on the museum's ownership of the piece. But all this misses the point. The US taxpayer should not be footing the bill at all on such stale claims. If the Egyptian military dictatorship really believed it had a claim, our courts our open to it and one would think these experts would be only too willing to help the generals to pursue an action. The ACCG has requested reconsideration of a ruling that seems to suggest there is no defense to forfeiture of the Guild's coins other than to provide documentation to prove legal import. The ACCG's memorandum argues such a ruling is contrary to the plain meaning of the governing statute and inconsistent with the government's prior representations to the Court that helped justify dismissal of the ACCG's declaratory judgment action seeking to modify or strike down applicable regulations. The Court's ruling and the ACCG's memorandum can be accessed here. As CPO understands it, the basis for the Egyptian claim to the Ka Nefer Nefer Mummy Mask was that it must have been stolen from Egyptian stores. But this claim is based on the further assumption that Egypt never allowed such materials to be gifted or sold. However, the truthfulness of this assumption was undercut with the admission that Egyptian officials gifted antiquities in the past. Moreover, it's CPO's understanding that the Egyptian Museum itself also sold antiquities at least until the 1960's. Alan Safani of the IADAA has also confirmed that antiquities sales were allowed in Egypt in the past, but he has also characterized the provision of official paperwork or export certificates as "haphazard." In CPO's view, all this raises the distinct possibility that the Saint Louis Art Museum may also have been able to defeat the Egyptian claim on the merits. Antiquities Coalition Contractually Obligated to Sue on Behalf of Egyptian Military Dictatorship? Lawyer's Committee to the Rescue? The Egyptian Military Dictatorship has indicated that it won't give up on its efforts to take the Ka Nefer Nefer Mask away from the Saint Louis Art Museum. If, as it appears, yet more legal action is contemplated, perhaps the "Lawyer's Committee for Cultural Heritage Preservation" or "Cultural Heritage Lawyer" Rick St. Hilaire will take on General Sissi's case "pro bono." At least, more U.S. taxpayer dollars won't be involved. US Taxpayer to Pay SLAM's Attorney's Fees? The US taxpayer has already paid dearly to pursue a stale claim to the Ka Nefer Nefer Mummy Mask at the behest of now disgraced (but perhaps to be rehabilitated) Zahi Hawass and the Egyptian Military Dictatorship. Now, pursuant to a statute meant to reimburse claimants who successfully defend their interests in seized property, the US taxpayer is likely to also be stuck for a bill for the Saint Louis Art Museum's attorney's fees. This is as it should be, but hopefully the government will be more discriminating in what cases it pursues in the future. Too often, the decision seems to be made on little more than pressure from the archaeological lobby and the State Department, whose primary interest seems to be to bend over backwards for nationalistic foreign potentates. Now that the Saint Louis Art Museum has prevailed on appeal in its long running battle to save the Ka Nefer Nefer Mummy Mask for the good people of Saint Louis, MO, its high time for President Obama to right a wrong and reseat Saint Louis Art Museum Director Brent Benjamin on CPAC. Unfortunately, although President Bush appointed Benjamin to the post, the State Department never allowed him to serve, presumably because of pressure from the archaeological lobby and then Egyptian Antiquities Pharaoh Zahi Hawass. It's now time to right this wrong and for President Obama to reappoint Benjamin to CPAC at the earliest possible opportunity. The US Court of Appeals for the Eighth Circuit has affirmed a decision dismissing the government's forfeiture complaint against the Ka Nefer Nefer mummy mask. The ruling was made on procedural grounds relating a government motion to amend its forfeiture complaint following a dismissal order, but a win is a win for SLAM, the Saint Louis Art Museum. Try as archaeological lobby might to put a smiley face on the Egyptian military dictatorship in order to justify a MOU with the US, the real Egypt keeps on coming through. Indeed, it's not even safe to be a comic in the country any longer. Yet, protesting against shadowy foreign "cultural racketeers" is apparently still just fine. CPO may not agree with his colleague's desire to restrict Egyptian coins, but David O'Conner and the American Research Center are to be commended for their efforts to train Egyptian conservators and hire their own site guards. Moreover, CPO appreciates Brian Daniels' suggestion that archaeologists hire their own guards and publish their reports in Arabic in addition to English or some other language. These are small steps, but focused ones that will have a positive impact on the appreciation and protection of Egypt's cultural heritage. CPAC Chair Prof. Patty Gerstenblith (PG, DePaul, Public Representative) began by thanking all speakers or those who had provided comments to CPAC. She also suggested that the speakers touch on one or more of the four determinations for regular restrictions. The following CPAC members were present: Katherine Reid (KR, Cleveland Museum (retired)-Museum); Nina Archabal (NA, Minn. Historical Society-Museum); Marta de la Torre (MT- Florida International University, Public); James Willis (JW, James Willis Tribal Art-Trade); Nancy Wilkie (NW-Carlton College, Archaeology); Barbara Bluhm Kaul (BK,Trustee, Art Institute of Chicago- Public); Jane Levine (JL, Sotheby’s Compliance Department (ex-prosecutor)- Trade); and Rosemary Joyce (RJ,U. Cal., Berkley-Anthropology); Lothar von Falkenhausen (LF, UCLA-Anthropology), and Thomas Murray (TM, Thomas Murray Arts-Trade). KR, NW and JW also served under the Bush Administration. The others are Obama Appointees though PG and MT also served the Clinton Administration. There was also staff present including CPAC Executive Director Maria Kouroupas and Committee archaeologists. The following individuals spoke: (1) David O’Connor (DO, American Research Center in Egypt); (2) Laurel Bestock (LB, Brown University); (3) Douglas Boin (DB, Saint Louis University); (4) Elizabeth Varner (EV, Lawyer’s Committee for Cultural Heritage Preservation); (5) Peter Tompa (PT, International Association of Professional Numismatists and the Professional Numismatists Guild; (6) Wayne Sayles (WS, Ancient Coin Collectors’ Guild); (7) Carmen Arnold-Biucchi (CAB, Harvard University); (8) Alan Safani (AS, International Association of Dealers in Ancient Art; (9) Monica Hanna (MA, Egyptologist and activist; (10) Sarah Parcak (SP, University of Alabama at Birmingham); and (11) Brian Daniels (BD, Penn Cultural Heritage Center). DO- Looting was under control in Egypt before the Revolution. An MOU is necessary to address recent looting. Egyptian authorities are also facing reduced resources. The American Research Center has been active in Egypt since 1948. There has been a long and successful history of collaboration with Egyptian colleagues. The Center has trained hundreds in conservation. DO in response to a question from MT indicates that most who have trained still work in the public sector. In response to a question from JW, DO indicated the Center has paid for site guards. During the revolution, looter’s pits appeared at the group’s sites. The police were initially slow to respond, but now an armored vehicle protects the site. In response to a question from NW, DO indicates site security is an Egyptian responsibility under the terms of the Center’s excavation permits, but the Center is now funding guards. In response to a question from LF, DO indicated that stability and the economy need to improve before problems will end. DO further discusses conservation efforts in response to a question from MT. DO believes funding for conservators has had the greatest impact. In the past, the Center hired North American conservators, but that is no longer necessary. The Center pays the conservator’s salary when they are working on Center projects. These individuals are government employees seconded to the Center. NA asks about political instability. DO states despite the problems, he is optimistic about the future. JL observes that what Egypt really needs is dollars. LB- Goes on 5 week excavation seasons. She goes with five staff and hires 100 locals. Extra site security is needed. LB found a cache of 300 Ptolemaic large bronzes. It seems to be a ritual deposit. They were helpful in dating the site. Egyptian authorities helped protect them from looting. Looters appeared at her site, but were driven off by locals. None were caught. TM asked about the coin hoard. They appear to all be minted in Egypt. They appear to be a votive deposit. The 300 coins weighed approximately 15 kg. TM wonders about educating the local people about protecting antiquities. He’s concerned that there have been calls within Egypt to destroy them as pagan idols. LB believes that hiring local workers helps encourage them to protect antiquities. DB is concerned about the use of unprovenanced manuscripts by American papyroligists. He believes many are harvested from the inside of “paper mache” mummy masks. He specifically mentions the “Jesus Wife” and Sappho manuscripts. NW observes that the AIA has lobbied the American Society of Papyrology about its publication of manuscripts harvested from such sources. EV believes that Egypt has satisfied the criteria for a MOU. There is serious looting. Egypt has demonstrated its commitment to preserving its patrimony. ICOM’s Red List was an early effort to help. Many countries have signed the UNESCO Convention and/or have interdicted looted Egyptian artifacts so the concerted international response is met. Looting cannot all be stopped at the source. NA acts about Egyptian self-help measures. EV believes Egypt is doing what it can. PT’s oral statement can be found here. We should all be concerned that news reports suggest the MOU is a done deal. At most, CPAC should recommend restrictions on Pharaonic material of cultural significance and later site specific material. Coins should be excluded. It does not appear that metal detectors are in wide use so it’s unlikely many are being found. Ptolemaic coins circulated within an Empire that reached beyond Egypt. Roman Egyptian Tetradrachms also appear to have travelled given finds in the UK and in Eastern Europe. These coins should not be restricted because one cannot assume they are found in the confines of modern day Egypt. LF asks about how PT knows the MOU is a done deal. PT responds he only knows what he reads in the newspapers, and that Egyptian State media quoted a US Embassy official that seemed to suggest as much. LF believes that the fact that Egyptian coins are found outside of Egypt helps prove they are significant enough to restrict. JW counters that “speech” by noting the coin issue is a very difficult one. PG asks about Egyptian Tetradrachms. She wanted to know if they represented a relatively small number of PAS finds. PT agreed, but argued there were enough to suggest the coins regularly circulated outside of Egypt. RJ asked about documenting ancient coins. PT indicated the sheer numbers make that difficult to do. He also noted that the documentation requirements do not impact Europeans and that is where most coins are being imported from. WS has been a coin dealer for some 50 years. The ACCG has not opposed MOUs per se. The ACCG does oppose import restrictions on coins. Coin collecting is an avocation. The ACCG has some 22 member clubs and represents the interests of about 50,000 ancient coin collectors. At WS’s last appearance before CPAC when the Greek restrictions were being discussed, WS reminded CPAC that if collectors are expected to follow the law, the State Department should too. MT asks WS about his written statement that Egypt is not adequately protecting archaeological sites. WS indicated that was his perception based upon what he has read. NW asks about coin circulation. WS indicates that the Ptolemaic closed currency system was a matter of keeping foreign coins "out" not Ptolemaic coins “in” the Empire. He also noted that Roman Egyptian Tetradachms had an equivalent silver content to one denarius so it makes sense that they circulated. RJ asked if you can know whether a coin is illicit from looking at it. WS indicated that would be difficult. She also asked about documentation. WS indicated this documentation was difficult to provide as a practical matter. RJ indicated she regularly records shards. CB favors restrictions on all coins as long as they were first discovered in Egypt. CB acknowledged that other coins circulated in Egypt that were not struck in Egypt. Early coins circulated due to their intrinsic value. Coins are important because they are issued by governments. BK asked how customs officials will be able to tell them apart. CB indicates she has already consulted with Customs officials about coin seizures. She noted the Ptolemy’s also struck coins at other mints outside of Egypt. CB also indicated that more valuable coins are more likely to have a provenance. For lesser coins, this is more “difficult.” She indicated collectors need to be educated about the importance of retaining this information. It is wrong to assume a coin is found where it was struck. Sometimes, like with early coins from S. Italy, you can make such an assumption. You cannot make such an assumption with coins of Alexander the Great. Gold and silver coins tended to circulate; bronze stayed closer to home. AS is a third generation dealer. His family originally came from the Middle East. IADAA have seen no increase in material available since 2011. Egypt’s most pressing problem is combatting religious extremists who see ancient artifacts as pagan material that should be destroyed. AS also questions Egypt’s self-help measures. Egypt only appears interested to the extent that tourist dollars are also involved. He also states that artifacts were legally sold within Egypt decades ago with no effective export controls. Issuance of export documents was “haphazard.” Any documentation that was provided contained only very basic descriptions of the artifact. AS is not surprised that such documentation would be lost or discarded over time as it would not be considered important. JL asks about the impact of the Shultz case on the market for Egyptian artifacts. AS indicated that this case prompted high end dealers to only deal in artifacts that can be traced back to 1983, the date of Egypt’s patrimony law. AS acknowledges the CPIA calls for a far more recent date. AS wonders why Egypt would “shoot itself in the foot” by asking for import restrictions. JW asks about orphan artifacts. AS believes the orphan artifact issue relates to the 1970 date. 1983 is the crucial date for Egyptian artifacts. One CPAC member noted MOUs may help educate Egyptians about their cultural patrimony. In discussing the issue further, JL observes that import restrictions will not impact Egypt’s patrimony law. AS does not think a MOU will make Egyptians more likely to take care of their own cultural patrimony. AS deals in high-end material. AS knows nothing about eBay and will not venture to guess about this type material. MH hands out her presentation which shows pictures of the aftermath of looting. She maintains that organized gangs are responsible for looting. Coptic and even Islamic material is at risk. Looters look for all sorts of material including coins. Bedouins smuggle material through the Saini to Israel. Guards need better training. JL wonders whether the threat of criminal prosecution has kept material from the US market. MH maintains material on eBay is looted. The UAE is another place where looted material goes. MH is meeting with UAE officials to get this stopped. TM finds it hard to believe there is some grand conspiracy between looters in Egypt and dealers in the US. He wonders about all the US aid that has been given and whether some of that can be used to protect archaeological sites. He also thinks that archaeologists have an obligation to reach out to local communities. RJ asks MH if the entire market in Egyptian artifacts should be shut down. MH indicates she is only interested in shutting down the market in material that left Egypt after 1983. She believes the trade should be ended until the looting emergency gets under control. RJ also asks if MH if she is against encroachment of archaeological land by cemeteries because it damages the sites or it keeps them from being excavated by archaeologists. She indicates the latter. BK asks about the government. MH indicates she has spoken to both presidential candidates about the issue. The real need is security. BK notes that a MOU would not stop artifacts from leaving Egypt’s borders. MK says there are already 12,000 security guards. Heritage awareness needs to be raised. USAID needs more programs. She has met with UAE officials to stop artifacts from going there. BK asked who funds MK’s organization. MK indicates they are all volunteers. They use Social Media and Facebook. SP discusses her work evaluating looting from satellite images. The Society for American Archaeology and National Geographic have funded her work. Remote sensing has been used to survey sites since satellite imagery became widely available in 1999. A comparison of that imagery from before the Arab Spring and after the Arab Spring shows that looting has increased dramatically. There are 100’s of new looter’s pits. High resolution satellite pictures dating from 2002 have allowed this work. Looting has worsened since 2011. The MOU is vital to address this problem. TM wonders if the archaeological community is being “melodramatic” about the looting, particularly about the estimates of the value of antiquities illegally removed from sites. He also wonders if this is undercutting otherwise useful work. SP explains her methodology further. She states that based on knowledge of the site, each site is given a percentage of high status and low status tombs and values assigned accordingly. She thinks they may be actually undercounting to a certain extent because there is more looting than what can be seen from counting holes. She is comfortable with a figure to the billions. She also believes the types of materials that are looted are the types of materials found on line. KR asks if the police were given her data. SP indicates that the Egyptian Antiquities Authority was provided with the data. SP does not have a direct channel to the Egyptian police. NA wonders whether the political situation will preclude protecting sites. SP thinks we need to be optimistic the Egyptians will get things under control. BD believes information garnered from the media indicates the Egyptians are trying to protect their own archaeological sites. The Italian Caribinieri have provided some training. There are approximately 12,000 site guards, not an insignificant number. The guards make only $40 per month. They need better training. Professionalism also needs to be fostered. The emergence of groups (such as MH’s) is a positive development. MT wants to know where all this looted material is going. BD acknowledges it has not appeared in quantity yet, but thinks it will take 3-5 years to flow through the system. BD acknowledges we still have not seen much Iraqi material on the market. MT wonders if looting is done on commission. BD indicates he would not be surprised if there was some. TM wonders if it is going to the Gulf states and Russia. He also wonders if there is a chance such material does not exist. BD indicates there would be no reason for looting if it did not exist. NA hopes there will be efforts to educate the Egyptian populace. BD indicated he supports foreign archaeologists helping to pay for security. They should also make sure their reports are also translated into Arabic. With that PG thanked everyone for their comments and called a recess to allow the speakers to leave the room. That's how the archaeological blogosphere is painting the "opposition" of the "coineys" to the proposed MOU with Egypt. But only those with tunnel vision would think that those who represent 91% of the public comments are "isolated" or that qualms about the MOU were only raised by "coineys." What of the AAMD's and former CPAC member Kate Fitz Gibbon's critical public comments? It is true far more proponents than opponents appeared at the CPAC meeeting. But proponents were largely academics who most likely are being reimbursed in some fashion for their travel to Washington, D.C. Most "coineys" simply don't have the time or the funding to attend. CPO hopes to place its own summary of the MOU on this blog in the near future, but as is the case with other "coineys" sometimes other work must take precedence. When a passionate collector passes away his collection is often sold off by heirs uninterested in maintaining the collection. But this sometimes is easier said than done, particularly if the collection is one of historic armored vehicles. So, what do you do? Sign it over to another like minded organization. They may need to auction off at least part of the collection, but hopefully the rest will be maintained in a museum open to the public. So if you have the parking space, the financial wherewithal and the ability to maintain an armored vehicle why not help out with a strong bid for a M-20 armored car? It would look good in your driveway. Here is what I said more or less at today's CPAC public session for my prepared comments. CPO hopes to report on the public session in the not too distant future. We should all be troubled that both the New York Times and Egyptian state media have already proclaimed that a MOU with Egypt is a “done deal” and what that says about our own State Department which is so fond of lecturing the Egyptians and others about “democracy” and “rule of law.” Even without such news reports, the dubious proximity of this request to Egypt’s much criticized presidential election should pose a basic question: Is the aim of this MOU to foster cultural heritage preservation or to help “legitimize” General Sisi and his government by recognizing its rights to control all artifacts from Egypt’s glorious past? The archaeological lobby portrays import restrictions as a necessary expedient to protect Egypt's cultural patrimony. But, from whom or what? “Cultural racketeers?" No! Actually, poor stewardship, corruption and an absolutely Pharaonic view of state ownership devalues artifacts so thoroughly within Egypt itself that they are either destroyed or smuggled from the country, presumably more often than not with "inside help." Frankly, Egypt is such a mess, restrictions won’t help there, but they will certainly damage small businesses and collectors who cannot come up with documentation necessary to import minor artifacts that typically don’t carry any provenance information. So, at most, CPAC should only recommend restrictions on Pharaonic material of cultural significance and site specific material from later “foreign” Hellenistic, Roman and Islamic cultures. Of course, coins should be exempted, and not only because import restrictions on them impact the most American citizens. First, there is no indication metal detectors are in widespread use in Egypt, so it is highly unlikely that coins are being illicitly excavated there in any significant numbers. Certainly, no large influx of ancient “Egyptian coins” has arrived onto our shores since the Arab Spring degenerated into first Islamic and now military dictatorship. Second, individual coin types typically exist in many multiples. It’s hard to conclude they are generally “of cultural significance” under the Cultural Property Implementation Act. And please, let’s not conflate “archaeological interest” with “cultural significance.” They are two distinct things. Third, the CPIA only allows restrictions on artifacts "first discovered within" and "subject to the export control" of Egypt. “Closed monetary system” or not, Alexander, the Ptolemy’s, the Byzantines, and the Ottomans all struck coins in Egypt for use throughout their Empires which encompassed land both inside and outside the confines of modern day Egypt. Maps don’t lie. Look at this one of Ptolemaic “Egypt.” It stretched into Libya, Israel, Lebanon, Syria, Cyprus, and Turkey. And this one of Hellenistic coin finds of Alexandria Mint coins. It shows coins found throughout this Empire and beyond. Seeing is believing. While a “closed monetary system” argument may be of greater validity when we speak of Roman Egypt, new research based on finds recorded under the Portable Antiquities Scheme also demonstrates that Roman Egyptian Tetradrachms --which had the value of one Roman silver Denarius-- travelled as far away as Britain. I’d also refer you to the public comments of numismatist Shawn Caza (ID: DOS-2014-0008-0247) which speak about finds of similar coins in Germany, Denmark, Switzerland, Austria, Belgium, Morocco, East Africa, Central Europe and the then USSR. Roman Egyptian Tetradrachms—like their Greek counterparts that have been exempted from import restrictions –also appear to be items of international commerce. Certainly, there can be no issue at all about the few Roman Imperial coin types –denarii and late Roman bronzes—also struck at various times in Alexandria. Like similar coins struck elsewhere, they circulated throughout the Empire and beyond. And what of the notion that all that really matters is that such coins may said to be found “predominantly” in Egypt? First, we would question any such factual assumption based on any limited evidence that may be provided. Second, the plain meaning of the CPIA requires more—that such coins are only found within the confines of modern day Egypt. CPIA Section 2604 requires that designated lists can only encompass material covered by a particular agreement, i.e., “first discovered” there. So, despite any pressure to “Say yes to Egypt,” please pay heed to facts, the law and the 91% of the public comments which either oppose the MOU or the extension of restrictions to coins. If we really want to be models to Egypt for what “rule of law” and democratic process means, you can do nothing less. Thank you. Kate FitzGibbon has commented for the Committee on Cultural Policy that support for the Egyptian MOU depends on an ability to suspend one's disbelief. CPO agrees. There is a strange disconnect between what appears on the front page of national papers and what one sees on the arts pages. On the front pages, one reads about a coup, military dictatorship, and the repression of political dissenters and religious minorities. Meanwhile, on the arts pages and in the comments supportive of a MOU, one only hears about Egypt, "the victim." Let's get real. Isn't it more logical to connect what's happening on the front page of the paper with what really ails Egypt's antiquities? One Collector's Response to "Egypt's Looted Antiquities"
The MILINET Listserve, which is read in Washington, D.C., defense and foreign policy circles, published this reaction to an opinion piece by Erin Thompson, a junior professor at CUNY's John Jay School of Law. The writer is a defense analyst and experienced coin collector who also serves as the "First Counsel" of the Ancient Numismatic Society of Washington, D.C. CPO notes that recent data from the PAS and Treasure Act demonstrates that Roman Egyptian Tetradrachms did circulate to some extent in far off Britain, perhaps brought there with Roman Legionaries or Auxiliaries who previously served in the region. This article is filled with distortions and propaganda typical of academic archaeology's holy war against collectors. To begin with, ancient "Egyptian" coins are almost entirely Greek and Roman. Although the Roman coinage of Egypt did not circulate beyond that region, the Greek coins of the Ptolemies circulated throughout the eastern Mediterranean and beyond - they are often found in Cyprus, Libya, Syria, Lebanon and Israel. Coins were mass-produced in thousands or even millions. Museums are massively uninterested in coins which are small, hard to display, and troublesome to curate properly. The only coins usually dug up at archaeological sites are "stray finds" -- low value small change in poor condition, of no interest to collectors. Coins that enter the ancient coin market are found in "hoards" - usually a clay pot buried far away from inhabited places. Since there were no banks in the ancient world, if you wanted to keep your money safe, you buried it in a remote place. If you never went back to retrieve it, it's still there. Hoards therefore have almost no archaeological "context" - the thing that academics are always whining about when it gets disturbed. In countries with sensible antiquities laws, like the UK, the finder and the landowner are entitled to split the fair market value of any hoard, but the national museum gets the right of first refusal on the purchase, and everything must be reported. As a result, we know more about the circulation of ancient coins in Britain than anywhere else. In most source countries, if you find something ancient and valuable in the ground, the police will confiscate it, it will either be tossed in a dingy storage room, or sold by corrupt cops on the black market, and you get thumped on the head for your trouble. In Italy, I was told that construction crews routinely and covertly destroy ancient finds, because if the bureaucrats find out, they will slap endless delays and expensive red tape on a project. Particularly in the Islamic world, the people and the governments increasingly regard all pre-Islamic artifacts as pagan abominations, and there is growing hostility toward Western archaeologists digging up reminders of cultures that practiced idolatry. Recall the tender loving care that the Taliban showed for the ancient artifacts they smashed with sledge hammers in the Kabul museum.